WE BUY HOUSES companies in Houston – are they credible? House Buyers are a recent phenomenon. In the old days, your options were selling through a realtor or becoming a FSBO (for-sale-by-owner). But in the last 15-20 years, Home Buyers have created a whole new industry…. Especially now with the onslaught of shows like Fixer Upper, Flip of Flop, Property Brothers and the likes. Full disclosure: I work in this industry. I used to be a Realtor and now work for American Home Buyer in Houston. I’m going to try and share how to spot the good and the bad without being too biased! Do they have a good rating with the local Better Business Bureau? Do they have good reviews and testimonials? Stability. Do they have an office and staff to help you? Do they answer the phone during normal business hours? Knowledge & Experience. They should be able to answer your questions, or get an answer pretty quick. Hopefully they have already handled transactions like yours and can answer from experience. This is especially important when dealing with foreclosure, divorce and probate. Financial Strength. Make sure the company actually has the money to buy your house. Many *”wholesalers” do not (see below for more info on this). Use a licensed Title Company. Title companies are professionals at closing real estate transactions and this helps ensure your transaction is being done correctly. In general, if a company has been around a while, has a good reputation, has a stable office, uses a licensed title company to close its transactions, is competent in answering your questions, and can demonstrate they have the funds to actually close the transaction, then you should be ok.
Sign Over Your Deed – If the Home Buyer wants you to sign over your deed without going through a title company, be leery. This is not necessarily illegal or even immoral, but you want to make sure you know what your doing before taking this drastic risk. High Pressure – If a House Buyer is strongly pressuring you to act right now or within a few days, this is another red flag. Again, it may be perfectly legitimate, but it could also be a sign that he has limited funds. Just Started – There are a lot of “newbie” and “wanna-be” investors out there (especially in the Houston area right now). Nothing inherently wrong with this except it’s likely not in your best interest. New investors probably don’t have the experience needed to tackle all the issues that typically come up in a real estate closing. Most important though is their lack of access to funds, which translates into them not being able to close as promised. This happens a lot. How many houses have you bought? What is your website address and do you have any testimonials listed there? What title company do you use to close transactions? *Wholesalers (a word of CAUTION)…. Wholesalers are the latest craze in real estate investing. Wholesalers don’t always actually buy your property even though they often portray they are. They write a contract to purchase your house and then go out and find another investor (who actually has the money to buy it), and “flip” the contract to them. You can usually spot a wholesaler because he will want to write “ABC House Buying Company, and or assigns” in the purchaser’s name on the purchase agreement. This is so they can then “assign” the contract to another party. This could end up disastrous for you. If the wholesaler doesn’t find another investor, and if he doesn’t have the money to close himself, you will end up with no real buyer on closing day. Professional Home Buyers are a legitimate option for selling your home. The question you should now be asking is whether to use one of them or go the traditional route via a realtor. For a detailed analysis of this visit: COMPARE: Home Buyer vs. Listing. Do you need to sell fast due to financial hardship like foreclosure, job loss, medical bills, etc? Does your house need a lot of work? 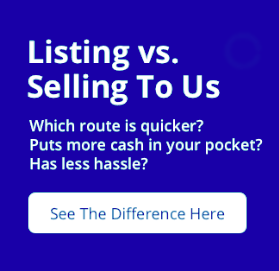 Do you want to avoid spending the time and blood sugar to deal with the listing, showing and marketing of your home through a realtor? If you answered Yes to any of these questions, then you should definitely get an offer from a Home Buyer. An immediate cash offer for your house. The time to decide if this is your best solution. The ability to close whenever YOU are ready. An offer with no contingencies (don’t need inspections, appraisals, or financing). The ability to take your house AS IS, with no need for repairs (and no need for your to clean or haul off left behind items). We offer all of the 6 items listed above. Further, we have been doing this since 1998 here in Houston. We have bought and remodeled hundreds of Houston area homes, and we would love the opportunity to buy yours. We have an A+ rating with the Better Business Bureau. We have the funds pay cash for your house, and we can close as fast as 3 days or we can close in 60-90 days... whatever time table you’re on! We buy homes in ANY CONDITION and regularly purchase homes in Probate, Divorce, Foreclosure etc. Visit our Who We Are page for more info on our company.